In 1889, the Louisville Colonels of the American Association finished in last place, compiling an unenviable record of 27 wins and 111 losses. The following season, Louisville pulled off one of the most amazing turnarounds in the history of our national pastime, clinching the American Association pennant on October 6, 1890 with a 2–0 victory over Columbus. That turnaround was assisted by a seismic shift in the baseball landscape during the winter of 1889–90 that included the formation of a third major league. Unlike the existing National League and American Association, Players League teams were partly owned by the players themselves. Most of the best players in baseball at the time jumped to the new league. Those jumpers included 27 from Association teams, among them Louisville star Pete Browning, who signed with the Players League Cleveland Infants. The Association’s instability ran even deeper. Two entire teams—including the champions from Brooklyn—switched over to the National League. 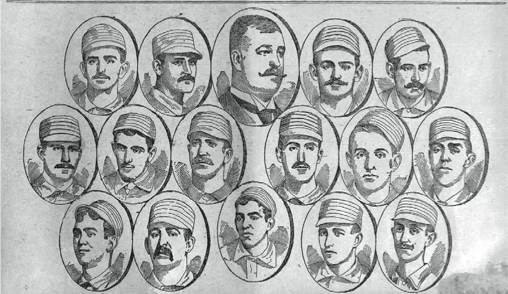 Their players were among 27 Association regulars from 1889 who played in the National League during 1890. A third club folded and a fourth dropped down to the minors. Four new franchises were added to the American Association to take their place. To make matters worse, on March 27, 1890 a cyclone tore through Louisville, killing over 100 people. On the night of the disaster, Louisville’s baseball team was enjoying a show at a local theatre, just a short distance from where the cyclone touched down. The next day, members of the ballclub assisted the town’s citizens in pulling the living as well as the dead from the rubble of the collapsed buildings. Shortly after the tragedy, the press started referring to the ballclub as the Cyclones and the name stuck. The team, under the ownership of Barney Dreyfuss, played outstanding baseball all year. As fall approached, the only formality remaining was when would Louisville officially wrap up the American Association championship? The Cyclones took the field at Eclipse Park in Louisville on Monday October 6 against the third place Columbus Solons. If the Louisville nine could defeat Columbus and if Toledo knocked off second place St. Louis, the Cyclones would become the first major-league baseball team to go from last place to first in just one year. Louisville’s manager Jack Chapman gave the starting assignment to his best pitcher, Scott Stratton. The 21-year-old hurler had a great year in 1890, posting a 34–14 record with a league-leading 2.36 earned run average. From the start, things went Louisville’s way. Second baseman Tim Shinnick robbed speedy Columbus lead-off hitter Jim McTamany of a sure base hit on a great stop and throw. In the Louisville half of the first, Columbus pitcher Hank Gastright who went 30–14 that season, walked Harry Taylor. A rookie who batted .306 with 45 stolen bases that season, Taylor advanced on a well-placed sacrifice bunt by Harry Raymond, then scored on Farmer Weaver’s line single to center. “Taylor started like a quarter horse for home,” the Louisville Courier- Journal wrote. Weaver advanced to second on the play, and one batter later took third on a fly to right by Jimmy Wolf, on his way to leading the league with a .363 batting average. Charlie Hamburg drilled a ball that got by leftfielder Spud Johnson, allowing Weaver to score the second and final run of the game. Stratton retired the Solons on three pitches in the top of the second, inducing a foul fly, pop up, and ground out. 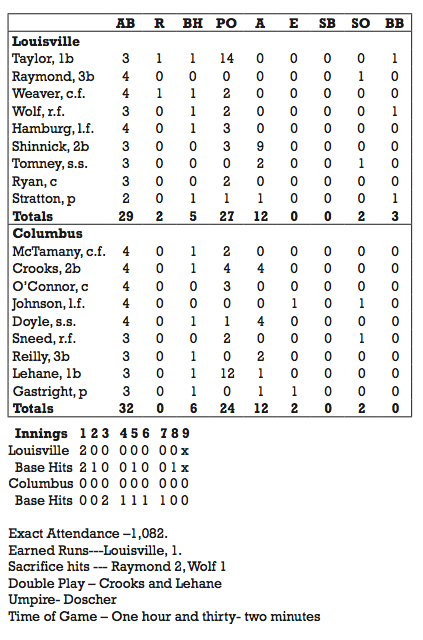 Columbus started a two-out rally in the third inning with consecutive hits by Gastright and McTamany, but Stratton retired King Crooks on a ground out to the first baseman to end the threat. Stratton wound up with a six hitter and didn’t allow a Columbus runner to reach third base, although the Solons might have broken the ice in the sixth but for a baserunning gaffe. Crooks, who had been jawing back and forth with the Louisville crowd for most of the day, reached base on a bunt. He advanced to second on a fielder’s choice, but in his eagerness to argue a close “out” call at first on the play the runner strayed from the bag and was tagged out by Shinnick. “The King, who moments ago was in his glory, walked back to the bench as meek as a lamb to his seat on the bench, the crowd yelling wildly at his discomfiture,” the Courier-Journal reported. The pennant was finally clinched when Louisville left fielder Charlie Hamburg tracked down a long fly ball off the bat of Jack Doyle for the final out. Gastright pitched a good game in the tough 2–0 loss, allowing five hits and tossing shut-out ball for the last eight innings. Louisville second baseman Shinnick had a phenomenal day, accepting 12 chances flawlessly, some quite difficult, while the rest of the infield played errorless ball. In the outfield, Weaver, Wolf and Hamburg each made outstanding plays to help preserve the win. Louisville finished with an 88–44 record in 1890, an astonishing 64-game improvement in the standings. The Cyclones went on to play the National League champion Brooklyn Bridegrooms in an early version of the World Series. Each team notched three victories in addition to playing to a 7–7 tie in the third game, but rain, cold weather, and dwindling attendance led to the cancellation of the series. The anticlimactic end to the 1890 campaign did nothing to diminish the Cyclones’ remarkable accomplishment of being the first major- league ballclub to go from worst to first in just one season.